It was so much fun to get together with friends and sew on Saturday. As I mentioned in yesterday's post, I was able to finish this flimsy, which was started at a retreat in October. For obvious reasons I'm calling it the Busy Pink Plus. 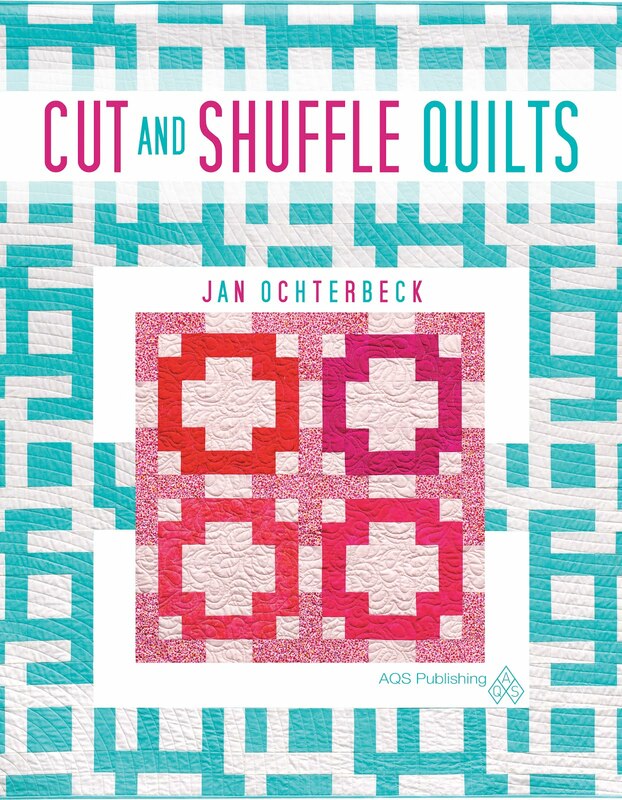 It's made using 3-1/2" cut squares, a convenient size for cutting from fat quarters. 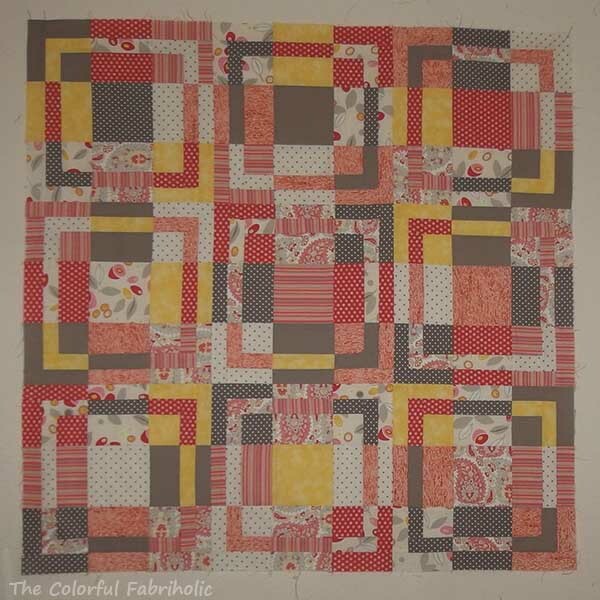 This was a stash-busting project to use some prints left over from other projects as well as some scraps and some stash. Since it's already so busy, I might as well use a bold stripe for the binding, which you can see here on the right. What's a little more bright color and pattern when there's already this riot going on?!!! 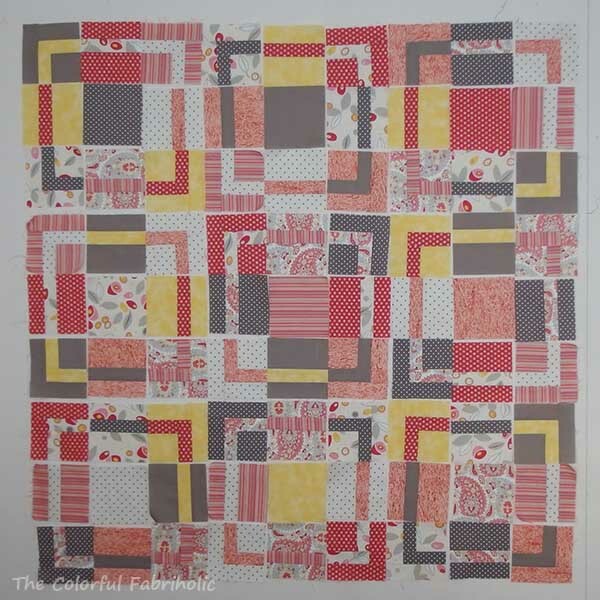 And yesterday I pieced a backing for it, also using up some stash. It's been fun to revisit some of these prints. That coral & aqua swirl was dated 2003 on the selvage. The bold stripe for the binding works fine with the backing, too. 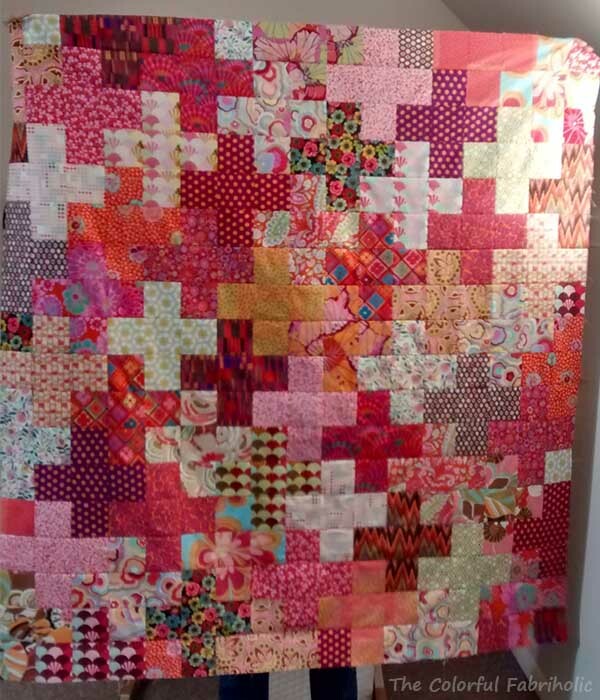 Hopefully I can get it layered and pin basted this week, and start on the quilting. I'm planning a simple diagonal grid to keep it soft and drapey. This will end up being a donation quilt. The flimsy measures 51 x 60, lap size for an adult or a good size for a tween or teenage girl. Yesterday was an all day sew-in with my Sew Bee It bee at a LQS. It was great to spend all day sewing with friends! I was able to finish two bee blocks for Jo and finish a top that was started at a retreat back in October. I'm calling it the Busy Pink Plus. It's a stash-busting project to use up some scraps, small bits and partial FQs of a lot of prints. Jo took the photo for me at the end of our sewing day yesterday. This measures 51 x 60, lap size, and I'll finish it up for Hands to Help and donate it. Stash Report: I know, February doesn't end until tomorrow. 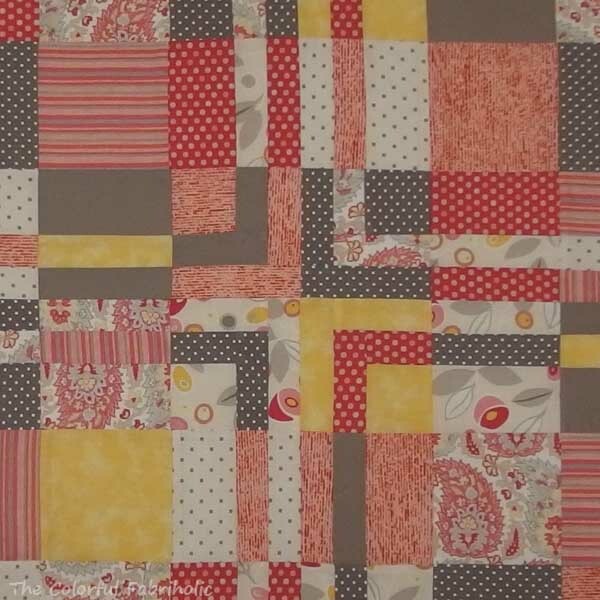 A LQS is having a 29% off sale tomorrow, and I plan to shop for backing for a WIP. I'll count it in March. YTD Net Change: 27-1/8 yards out. Yay! Depending on how much damage I do in Paducah in April, and how many finishes I can manage this year, I may actually have a chance of breaking even this year. February update: This was a tough month due to a lot of family obligations and other stuff going on. Hopefully I can spend more time sewing in March. 3. Organize project(s) for sew-in 2/27. Done - at the last minute! Good thing an already-organized WIP was left over from a retreat in October. 4. Layer & pin-baste one top. Not done. 5. Prep for trunk show March 2. Planned but not packed yet. 6. Keep up with Bee Blocks. 2/3 done but still need to finish blocks due March 1. I'm having a small outpatient surgery on my wrist in March so I don't know how much I'll be able to get done later in the month. Hopefully I can get at least these goals accomplished. If possible I'd like to layer and pin baste at least one more WIP. I finally got to spend a few minutes here and there in the sewing room this week. Seems like I haven't been able to sew in ages! I was able to finish this little Framed Nine Patch flimsy. This was a UFO started a few years ago, and it's on my list to finish this year. 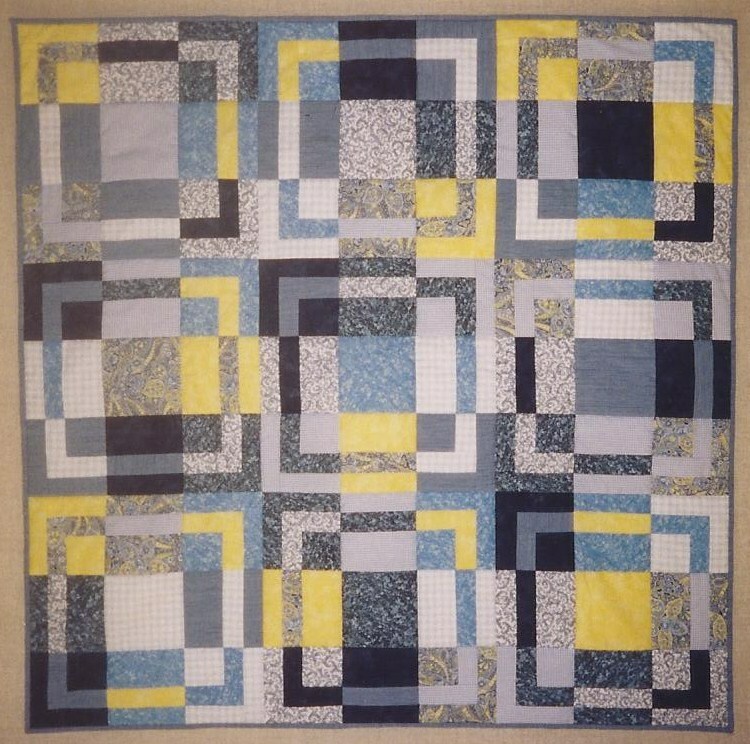 It moved up the list because I need a baby quilt for my hairstylist who's expecting a girl in May. She's decorating the baby's room in Kona Salmon. Well, these prints just happen to coordinate perfectly with Kona Salmon! So, for the first time in awhile, I have a Friday finish. Linking up with Whoop Whoop Friday at Confessions of a Fabric Addict and Friday Finish at Crazy Mom Quilts. Tomorrow I'll finally get to sew, all day. My Sew Bee It buddies are having a sew-in day at a LQS that rents out space. So today I need to organize and pack projects to work on. No problem, I have some WIPs that are in the piecing stage I can pull and take with me. Should be a fun day! And one more photo, because who can resist this cute face! 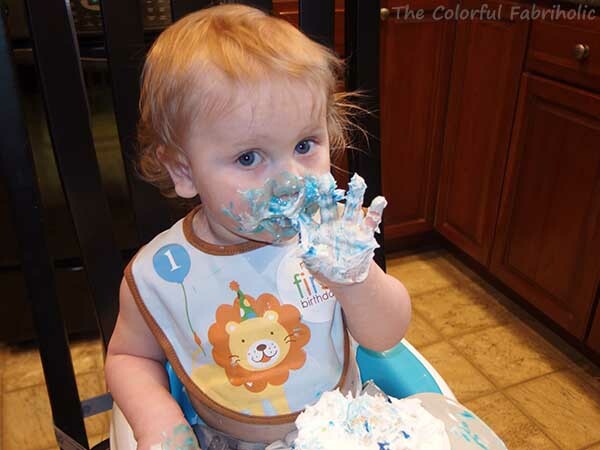 We hosted grandson CJ's first birthday party last weekend. I think he enjoyed his cake. 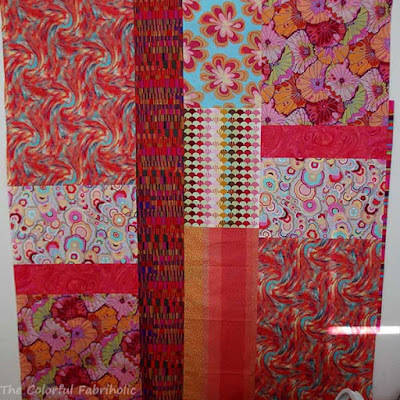 The guild I belong to, Circle in the Square Quilters, holds a fabric swap in a member's home for our February social meeting each year. 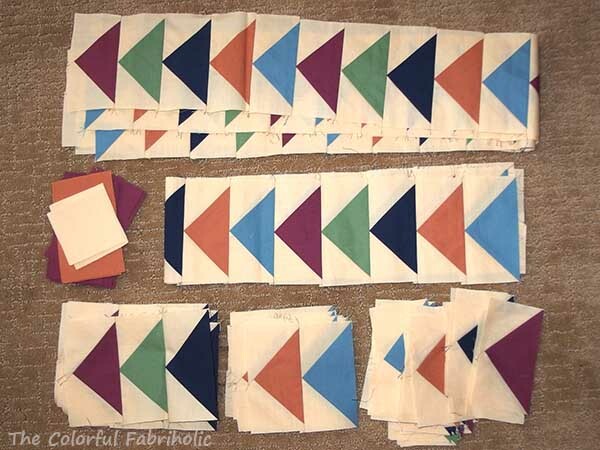 It's a great opportunity for destashing and adding some new-to-me fabric to my stash. Or as another member calls her stash, "curated fabric collection." Sounds so much less like hoarding, doesn't it! Everything gets laid out on Carolyn's big dining table, with extra stuff like batting, notions, and scrap bags elsewhere in her dining room. Then we have our social meeting with dessert and show & tell, then we all go back into the dining room and grab select what we want from the table. Anything left goes to Charity Sharity. Carolyn's only rule - she hosts every year - is that nothing be left behind at her house. I brought home only two new-to-me pieces of fabric, which I can use for donation quilts. I haven't measured the yardage, but there's less here than what I got rid of. Yay for the stash report! 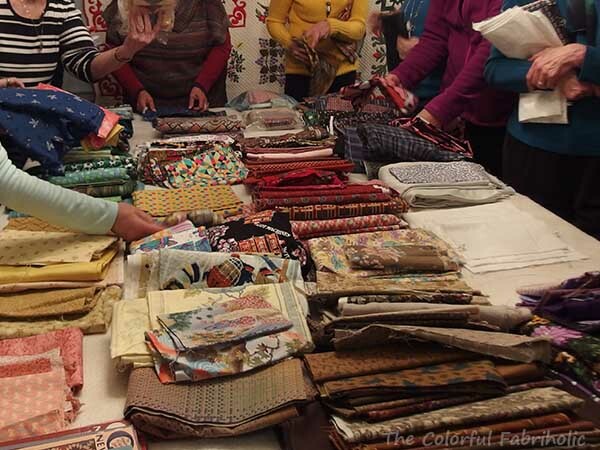 The CSQ fabric swap is always a lot of fun and this year was no exception. And Carolyn's pea-pickin' cake was delicious! (No, she doesn't know how it got that name). My husband came home from work the other day and asked me if I had a quilt I could spare. A coworker and his family are going through a tough time and it was a particularly difficult day for the fellow. Of course I had a quilt I could spare. I offered DH a choice of three, and he chose this one. So this quilt has now gone to a new home where I hope it will bring comfort to a family that's going through some horrific and tragic stuff. DH wrapped it in brown paper and gave it to the fellow on the parking lot at work, to protect the man's privacy. He was very toughed and grateful. DH and I both feel good about being able to give to a family in need of comfort. 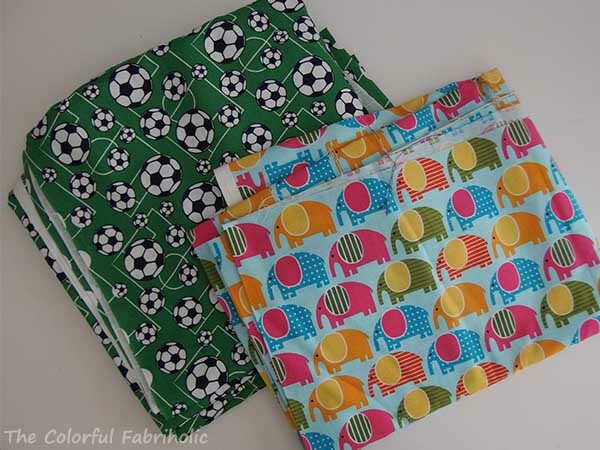 Linking up with Sarah at Confessions of a Fabric Addict. She understands. The parent blocks have been cut into pieces and the parts are on the wall. Now I'll spend time moving them around to get the colors and prints balanced. 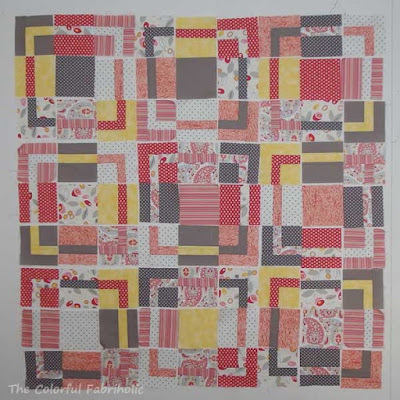 You can see how this will end up as nine framed squares, each square a nine-patch. This is the fifth time I've made a Framed Nine Patch; I've given several away as baby quilts. One was made of men's shirting fabrics and was given to the person who created the fabrics. She was the textile designer for men's sportswear at the company we worked for, and she specialized in, as she put it so eloquently, "pooping out plaids." 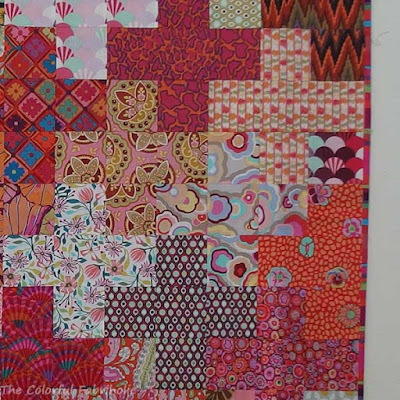 Making a quilt out of a fabric designer's own fabrics is common in our world of quilting today, but it was unusual and very much appreciated by my textile designer friend back in 2005. 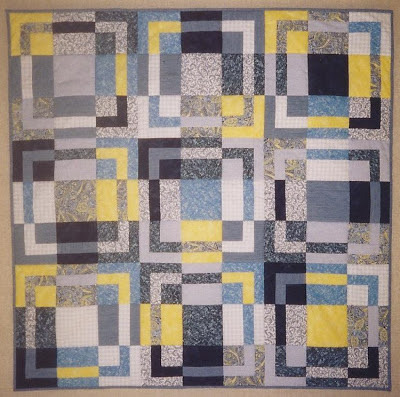 If you've seen my book Cut and Shuffle Quilts, you'll recognize that this design from the early 2000's is a precursor to the method and patterns in my book. Linking up today with Let's Bee Social at Sew Fresh Quilts. First, I'd like to thank everyone who left comments with condolences, thoughts, and prayers. Your kindness and thoughtfulness are much appreciated. 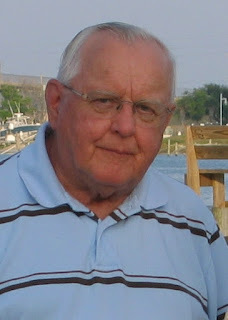 The trip to Arizona and the memorial service all went very well. Now I'm looking forward to getting back into the sewing room. Before I left, I chose a particular UFO to work on for February. Here are the parent blocks on the wall. They don't look like much, but a little slicing and dicing will fix that. I have enough of the paisley for the backing, and the stripe for binding. The colors are mostly soft pastels, but they look extra faded and washed out in the photo above; here's a close up that shows the colors better. 2016 is my year for tackling UFOs. 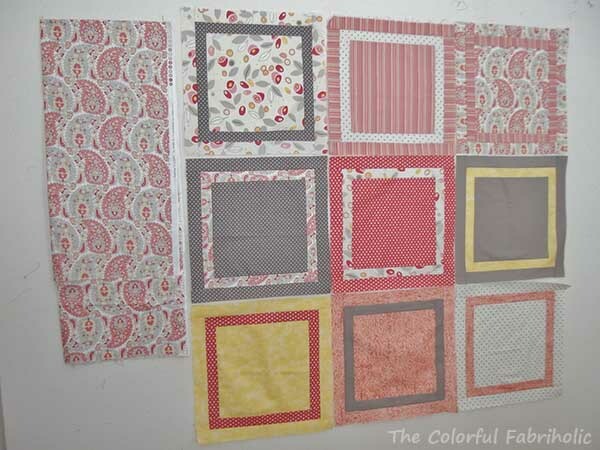 These parent blocks were started at the very first STLMQG sew-in several years ago. I chose this project for my next UFO to finish with a purpose in mind. My hairstylist is expecting a baby girl in May, and she's decorating the nursery in coral. She showed me a swatch of fabric someone is using to make curtains for her, and it's labeled Kona Salmon. So I pulled out my Kona color card and remembered this UFO - perfect match!!! So this month and next I'll get this UFO finished and it will make a sweet baby quilt for a little girl whose mom likes coral. 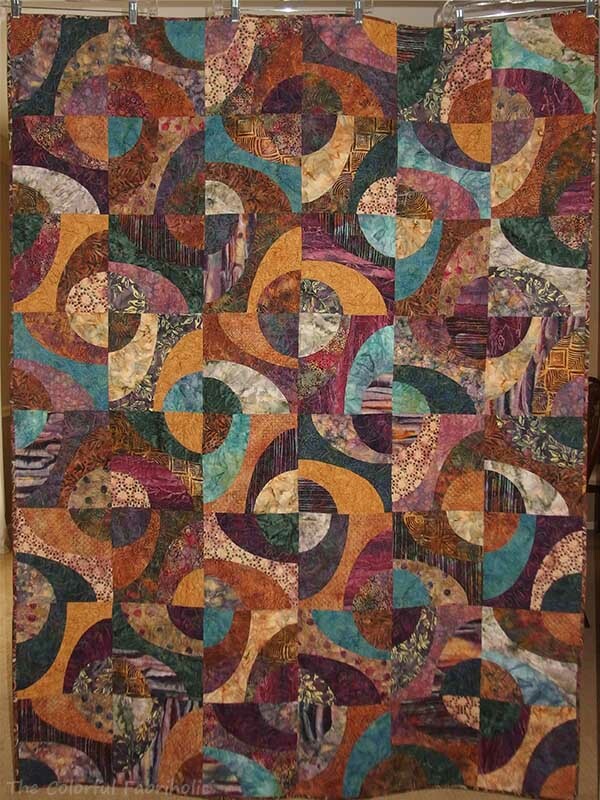 Julie of Idaho Quilter's Adventures recently celebrated her ten year blogiversary with a giveaway. Not just any giveaway. She gave away several of her quilts. You can read the story here. One of Julie's quilts really spoke to me due to its coloring and design, so I left a comment admiring Canyon Dance. Imagine my surprise when I got an email from Julie saying that I had won her giveaway, and she was sending Canyon Dance to me! Canyon Dance is gorgeous. It's sofa-throw size, all rich batiks, and custom quilted by Julie with different motifs in the different sections of the blocks. It's even more beautiful in person than in the photo. Julie even sent extra batik backing fabric for a sleeve. I plan to hang this one where I can enjoy it. When DH saw Canyon Dance, he asked about it. He said it's pretty but he didn't remember seeing it before. I told him the story of Julie's giveaway and that she gifted it to me. 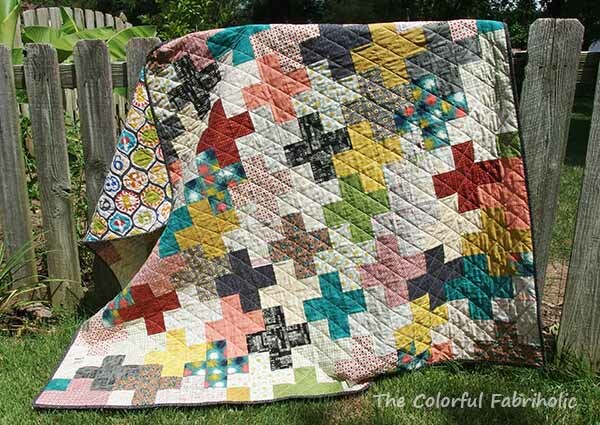 He thinks it's really great that she chose to give her excess quilts to fellow quilter lovers who would appreciate them. I totally agree! Canyon Dance has a label, which I think is very important. I also plan to print out Julie's blog post and our e-mail exchange and keep them in my quilt journal. Even though I didn't make Canyon Dance, I want its provenance documented for the future. 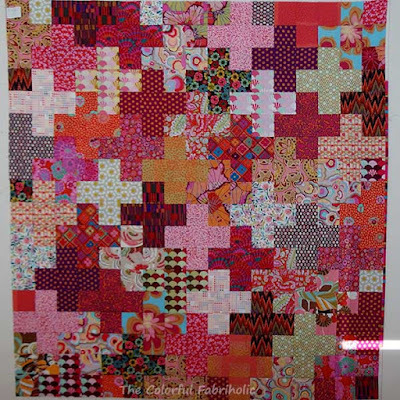 I'm linking up with Judy at Patchwork Times just to share this story of Julie's generousity. Nothing on my design wall today; I have to regroup after January's finishes and figure out the February UFO to tackle next.